Tableau Server can email server administrators about system failures, and email server users about subscribed views and data-driven alerts. 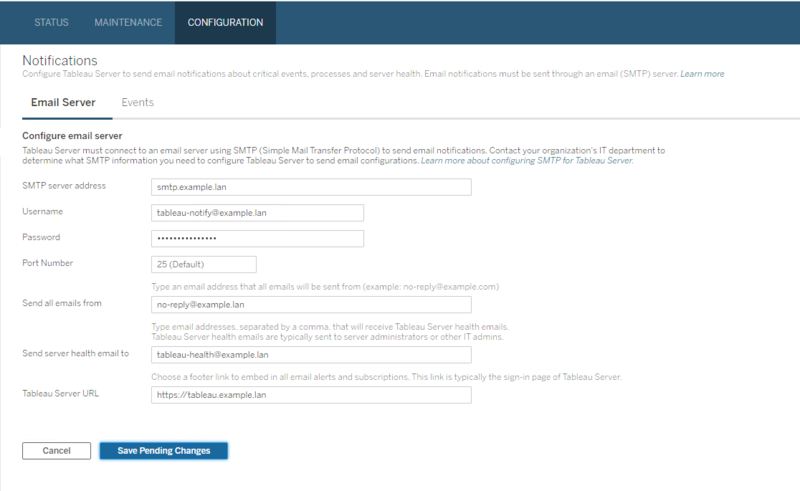 First, however, you need to configure the SMTP server that Tableau Server uses to send email. After configuring SMTP, complete the steps to configure notifications (Configure Server Event Notification), then when you start or restart the server, it will trigger an email notification, which confirms that you have set up notifications correctly. Encrypted SMTP connections are not supported for notifications or subscriptions. Configuring SMTP requires that you restart Tableau Server services. Click Notificationson the Configuration tab and click Email Server. For the initial configuration of SMTP, we recommend that you use the configuration file template below to create a json file. You can also set any single configuration key listed below with the syntax described in tsm configuration set. Copy the following json template to a file. Fill in the key values with your SMTP configuration. See the reference section that follows for more information about SMTP key options. Run the tsm settings import -f file.json to pass the json file with the appropriate values to Tableau Services Manager to configure Tableau Server for SMTP. Tableau Services Manager will validate the entity values. Run the tsm pending-changes apply command to apply the changes. See tsm pending-changes apply. This table lists all of the options that can be used to configure SMTP. svcmonitor.notification.smtp.server Address of SMTP server. svcmonitor.notification.smtp.send_account User name for SMTP account. svcmonitor.notification.smtp.port Port number for SMTP server. The default is 25.
svcmonitor.notification.smtp.password Password for SMTP server account. svcmonitor.notification.smtp.ssl_enabled Specifies whether the connection to the SMTP server is encrypted. The default is false. Note: This should be left as false. Encrypted SMTP connections are not supported for notifications or subscriptons. Note: You can override the system-wide email address on a per-site basis. For more information, see What is a site. svcmonitor.notification.smtp.target_addresses Email address to receive notifications. If email notifications are enabled, you need to include at least one address. Separate multiple addresses with commas. svcmonitor.notification.smtp.canonical_url URL of the Tableau Server. Enter http:// or https://, followed by the name or IP address of the Tableau server. Used in the footer of subscription email.